The Alder Gulch Shortline is a 30-inch narrow gauge tourist railroad now owned by the State of Montana. This unique railroad, built on dredge tailings along Alder Gulch, connects Virginia City and Nevada City with a one and a half mile mainline. The little railroad was built in 1964 by local entrepreneur, Charlie Bovey, who had dreams of extending the line into the town of Alder, eight miles to the west. John Ellingsen has written a short background article on the AGSL which can be found on the Travel Montana Web Site. Original AGSL motive power was provided by a couple of coal-fired Davenport Dinky locomotives obtained from the Anaconda Company smelter in Great Falls. Both burned in an engine house fire in 1991. On July 31, 1999, Engine No.12 was delivered to the Alder Gulch by John Larkin of the Escanaba & Lake Superior Railroad. He and his crew had worked for over two years restoring the locomotive to a museum quality condition. Engine No.12 was one of four 30-inch gauge outside-frame consolidations (2-8-0's) built by Baldwin for the Ferrocarril Mexicano in 1910. These were class E-2 engines rated at 134 tons for use on the Zacatlan Branch. It was announced the first week in February, 2010, that the No. 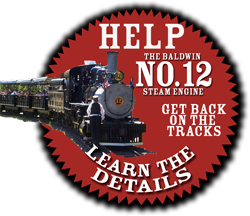 12 will not run during the 2010 summer season due to funding problems. More information on Facebook at: Alder Gulch Short Line Supporters Group.